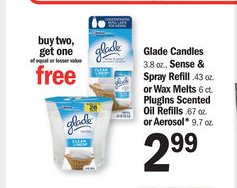 Starting 5/24 at Meijer certain Glade products will be on sale for $2.99 and when you buy 2, you get 1 FREE!!! With coupon's and apps it will make it a cheap deal! Final Price: As low as $0.48 for all 3, $0.16 each! Let me know if you see a better deal!